Today in our field of view will be Sigma 85mm F1.4 EX DG HSM telephoto objective lens. It has initial focus distance for lens of this type and big aperture, which allows to use it for land scenes shooting and for shooting of big astronomical objects. Its maximal and minimal appertures are : f/1.4 and f/16, accordingly, with 9 diaphragm blades; it is designed for full-frame sensors. Lens has 28.6 degrees field of view and 0.85 m minimal focusing distance with support of automatic focusing with use of Hyper Sonic Motor ( HSM ). 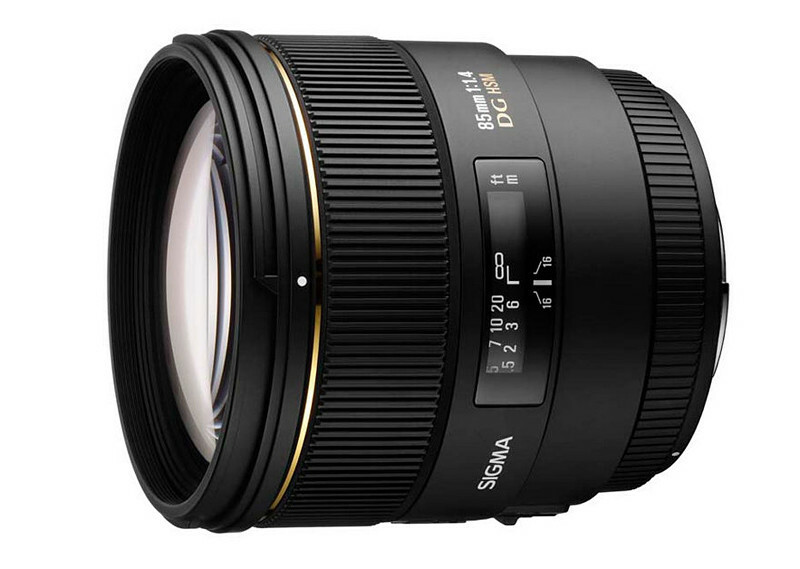 Lens is produced in variants for Sigma, Nikon, Canon, Sony/Minolta and Pentax mounts. It supports internal focusing and has no image stabilization. 11 lens elements in 9 groups are built into it, all of them are coated with protective and anti-reflective Super Multi-Layer Coating. There is ability to attach to Sigma 85mm F1.4 EX DG HSM optical filters with 77 mm diameter; its sizes are : 86.4 x 87.6 mm, and weight is : 725 g. Package contains : Sigma 85mm F1.4 EX DG HSM objective lens itself, frontal and rear caps, case, user’s manual and 1 year warranty card. All in all : this is a good objective lens, which has interesting characteristics, but its price is quite big : 969 USD at the middle of Autumn of 2015 year ( for comparison : there is ability to buy new Nikon D3200 camera for 350 – 400 USD ). Because of this it is more appropriate for photographers, which need its particular characteristics; for photographers, which just need telephoto objective lens it is better to look at models, that are priced at lower level. Among audio devices we will study today AUDIOTRAK MAYA U5 external sound card. It is oriented on high quality reproduction of 5.1 channel sound ( card supports also other modes : 4.1, 4.0, 2.1 and 2.0 ) and on transmitting of protected Blu-ray or HD-DVD signals to other devices. It has no professional line inputs and MIDI inputs and outputs, so it cannot be used in professional studio sound recording; it has microphone input, but it is more suited for voice chatting, than for studio-level sound recording. Audio card supports only 48 kHz sampling rate ( USB 2.0 bus does not allow higher sampling rates with such amount of channels, but for sound playback it is enough ) and 24 bits precision. It has optical digital S/PDIF input and output. 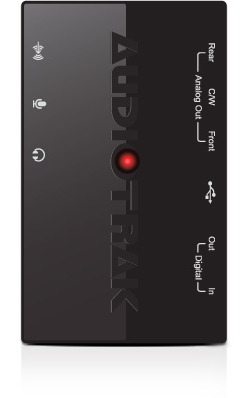 AUDIOTRAK MAYA U5 has built-in high quality controller VIA Envy USB 2.0 FS and digital to analogue converter ( DAC ) with 110 dB signal to noise ration ( this is good characteristic, if all other hardware components of card support sound processing and transmittance of such high clearness ). Package contains : AUDIOTRAK MAYA U5 sound card itself, USB cable, user’s guide and CD-ROM disk with drivers and software for Windows XP, Vista, 7 and 8 and Mac OS X. All in all it is good card for optimal price for multichannel sound playback for films, games, virtual reality applications and multi-channel music. Its external placement also allows to reduce electromagnetic interference ( EMI ) on card’s components, which is always present in computer system case. 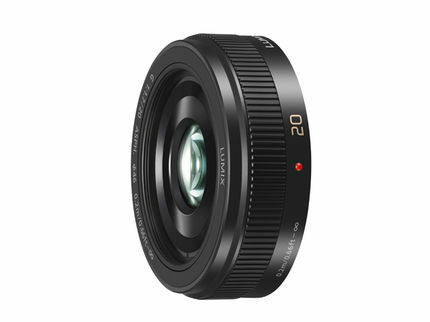 Today we will look on Olympus M.Zuiko 45mm f1.8 lens for Micro Four Thirds mounts. As it can be seen from its name, it has 45 mm fixed focus and maximal and minimal diaphragms f/1.8 and f/22, accordingly, with 7 diaphragm blades. It has 0.5 m minimal focusing distance with auto-focusing, which works via High-speed Imager AF ( MSC ) motor. It has 9 lens elements in 8 groups ( which is much for lens of such type ), among them 2 are E-HR lens elements; all of them are covered with protective and anti-reflective multicoating. Field of view is equal to 27 degrees, which is not much for prime lens; there is ability to attach 37 mm optical filters to it. Its sizes are : 56 x 46 mm, and weight is : 116 g. Package contains : Olympus M.Zuiko 45mm f1.8 lens itself, front and rear caps, decorative ring, user’s manual and warranty card. Overall it is not bad objective lens, but accounting its average characteristics and high price ( 399 USD at the middle of Autumn 2015 ), it is better to buy more functional prime lens with smaller price. Lets review top-level external USB sound cards Steinberg UR28M and UR824, which have already professional-level big studio features. They have the same : Yamaha D-PRE Class-A microphone preamplifiers, DSP Yamaha SSP2, 24 bits of precision for work with sound, separate monitor headphones outputs with independent volume level control, DAW Cubase AI in the package, fully metallic body and USB 2.0 connection, as previously reviewed sound cards of this family. UR28M is different in : support of 96 kHz sampling rate instead of 192 ( which are not always necessary, for example, human is not able to differentiate signals, which are recorded with 96 kHz and 192 kHz frequencies, but for professional use with subsequent processing high sampling rates are useful ); 2 analogue inputs and 6 analogue outputs; and 1 S/PDIF digital input and 1 the same output. The top most model UR824 supports : 192 kHz sampling rate; JetPLL synchronization for many devices to stay in sync; 2 digital optical S/PDIF ADAT outputs and 2 the same inputs; and 8 analogue inputs and 8 analogue outputs. Both cards have no MIDI inputs and outputs, so they are more suited for large studio use for analogue signals recording and playback, instead of use with digital instruments. Steinberg UR28M and UR824 have corresponding prices : 499 and 999 USD. Technical characteristics of microphone/linear inputs of Steinberg UR28M : working sound frequencies range is 20 Hz – 22 kHz ( with +0.1/-0.2 dB deviance ), dynamic range is 101 dB ( A-Weighted ), THD+N 0.002%, channels crosstalk protection is 114 dB, maximal input signal level is +22 dB, impedance is 4 kOhms, gain up to 60 dB and pad down to -26 dB. Instrumental Hi-Z inputs : maximal input signal level is +9.8 dB, impedance is 500 kOhms. Linear inputs 3 and 4 : frequencies range 20 Hz – 22 kHz ( with +0.1/-0.1 dB deviance ), dynamic range is 102 dB ( A-Weighted ), THD+N 0.001%, channels crosstalk protection 110 dB, maximal input signal level 16 dB ( with balanced connection ) and 13.8 dB ( with unbalanced connection ), impedance is 20 kOhms ( balanced ) and 10 kOhms ( unbalanced ). 2TR IN : maximal input signal level is +3.5 dB and impedance is 10 kOhms; maximal power, supplied to headphones outputs, is 35 + 35 mW with 40 Ohms impedance. Linear balanced outputs properties are : working frequencies range is 20 Hz – 22 kHz ( with +0.1 dB/-0.2 dB deviance ), dynamic range is 106 dB ( A-Weighted ), THD+N 0.001%, channels crosstalk protection is 129 dB, maximal signal level is +16 dB with impedance 75 Ohms. In addition to 96 kHz audio interface also supports sampling frequencies 44.1, 48 and 88.2 kHz; it draws maximum 8.4 W of energy, its sizes are 59 ( height ) x 164 ( depth ) x 291 ( width ) mm and mass is 1.4 kg. Steinberg UR824 has higher technical specifications : working frequencies of balanced microphone/linear inputs are in 20 Hz – 22 kHz range ( with +0.1 dB/-0.1 dB deviation ), dynamic range is 105 dB ( A-Weighted ), THD+N 0.0014%, channels cross-talk protection 125 dB, maximal level of input signal is +24 dB, impedance is 4 kOhms, maximal gain and pad are 60 dB and -26 dB, accordingly. Properties of instrumental Hi-Z inputs are : maximal input signal level is +10 dB and impedance is 1 MOhm. Linear outputs ( balanced ) : working frequencies range is 20 Hz – 22 kHz ( with +0.1 dB/-0.1 dB deviation ), dynamic range is 117 dB ( A-Weighted ), THD+N 0.0009%, channels cross-talk protection is 130 dB, maximal signal level is +18 dB and impedance is 75 Ohms. Maximal power, supplied to headphones equals to 75 + 75 mW with 40 Ohms impedance; besides 192 kHz device also supports 44.1, 48, 88.2 and 96 kHz sampling rates. Device draws 38.4 W of energy, its sizes are 480 ( width ) x 44 ( height ) x 275 ( depth ) mm and mass is 3.1 kg. Devices work in Windows 7, 8, 8.1 and 10 and Mac OS X with support of ASIO 2.0, WDM and Core Audio interfaces, through which they interact with modern DAWs : Avid Pro Tools, Ableton Live, Steinberg Cubase, FL Studio, Cackewalk Sonar, REAPER and others. Also Steinberg UR28M and 824 are Class Compliant and can work with Apple iPad 2 and newer via Apple iPad Camera Connection Kit. Package contains : Steinberg UR28M or 824 audio interfaces themselves, optical disks with drivers and programs, power supply unit, warranty card and user’s guide. On disks besides DAW Cubase AI there are : Yamaha Steinberg USB Driver, device control panel, UR28M/824 Extension ( for integration with DAW Cubase ), dspMixFx UR28M/824 ( for integration with other DAWs ), VST plugin Sweet Spot Morphing Channel Strip ( compressor and equalizer ) and VST plugin REV-X – reverberation. Interfaces are very functional and have great digital and analogue parts and large amount of connectors, they are oriented on professional work in large studios and on concerts, their prices are according. There is also ability to look on other audio interfaces of Steinberg, Behringer, Focusrite, Roland, ESI, M-Audio, Alesis and other companies production : among them there can be devices, that are more applicable to specific tasks and that have more acceptable prices for them. Lets review Nikon Nikkor 2137 50mm f/1.8D prime lens for Nikon F mounts. 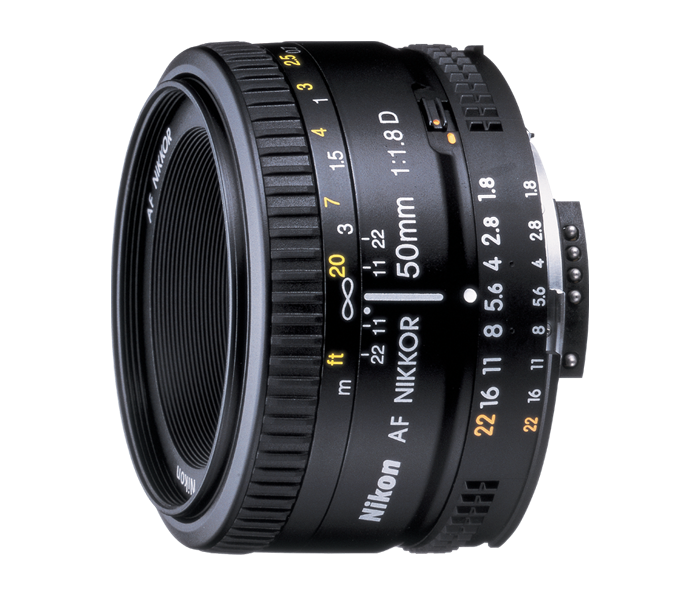 As it can be seen from its name, it has 50 mm fixed focus and maximal and minimal apertures f/1.8 and f/22, accordingly, with 7 diaphragm blades. It has 46 degrees field of view for 36 mm FX sensors and 31 degrees 30 minutes for smaller DX sensors; minimal focusing distance is 0.45 m with support of automatic and manual focusing. It has 6 lens elements in 5 groups, they all are coated with protective and anti-reflective Super Integrated Coating. 52 mm optical filters of Screw-on standard can be attached to it. Objective sizes are 63.5 x 39 mm and weight is : 155 g. All in all it is good objective lens with fixed focus, small lens elements amount and auto focus function, which costs affordable amount of money, in comparison with other objective lenses. Nikon Nikkor 2137 50mm f/1.8D Auto Focus can be recommended to novice and experienced photographers, who want to capture beautiful and clear portrait and panorama photos without zoom. 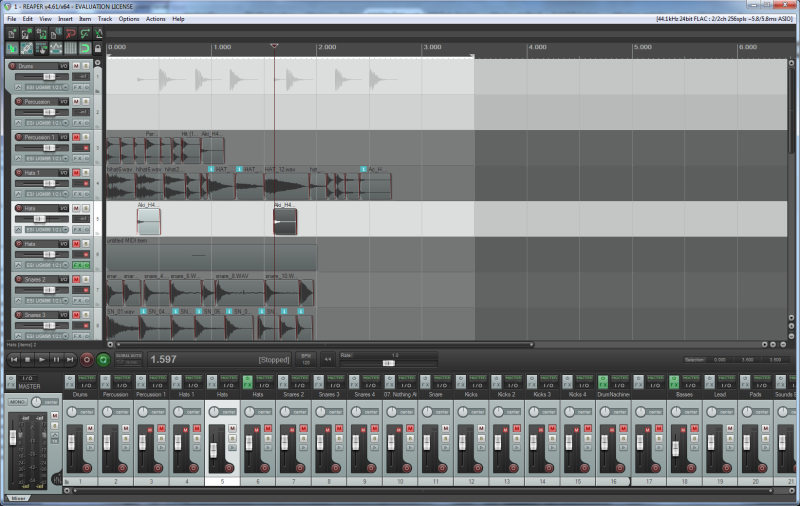 Today we will meet with DAW ( Digital Audio Workstation ) REAPER. Unlike other modern DAWs, which are oriented on sleek design to motivate users to buy them and on semi-automatic performance of different actions, REAPER is more oriented on professional work with sound and provides functional instruments, which provide lots of possibilities and require understanding of what user is currently doing and some degree of technical education in this area. Because of this : from one side, this DAW is more difficult to study for novices, but from the other side, it provides lots of possibilities, which may be unaccessible in other studios due to semi-automatic nature of their instruments. REAPER can be downloaded and used for free for 60 days; after this period of time there is need to purchase program : at its startup pop up window appears, which asks to buy program, after 5 seconds it can be closed and no functions are restricted; but this program worth its money and should be bought according to license. It costs 60 or 225 USD, depending on usage scenarios; its site is located here : http://www.reaper.fm/ . Lets briefly become acquainted with interface of program : in the central part there is tracks area, which allows to place sounds, MIDI notes, control automation of sounds, synthesizers, effects and other instruments and perform large amount of other operations; this is the main work area of program. To the left there is column with tracks handlers, which allow to control their volume, automation, switch on and off tracks, add instruments and effects to them and perform lots of other operations. Some tracks in this area can be made folders, which allow to group tracks and control them all and apply effects to all of them in bulk ( this also saves computer resources, because this way effects are applied to single track after mixing of all sounds into it, instead of application to each track individually ). At the bottom part of window there is mixer panel, which allows to control tracks parameters individually and set parameters of the whole composition. At the top part of window menu, buttons and hardware information reside. There is ability to work with DAW this way : record sounds or use existing ones, place them on tracks or attach VST instruments to tracks and place there MIDI notes, which activate these instruments; then, when composition will be ready, it can be exported into lossless formats ( FLAC, WAV and others ) or lossy formats ( Ogg, MP3 and others ). Before actual composition creation, there is need to think about it and feel it, make plan and then implement it. If there is no complete picture of composition, there is ability to create parts of it and its story : rhythm parts, melody, pads, sounds effects and experiment with them, by changing them and moving them here and there until feeling will come. Periodically I’ll write articles about work with this DAW, with VST instruments and effects ( FM-synthesizers, compressors, distortion, delay and others ) and will publish little examples for you to study on them. Lets say in ahead, that I’m not professional musician and for me it is hobby and rest after work, but I know how to work with this DAW ( there is not big amount of information of work with it ) and have knowledge of technical aspects of electronic music and can share my knowledge and experience and at the same time learn something by myself. Thats is all for today, see you in the next articles. Today we will review small studio level external USB sound cards Steinberg UR : 242, 22 and 12. Their characteristics are mainly similar to middle-level Steinberg UR44 sound card, which was reviewed earlier. The same : USB connection, 192 kHz sampling rate and 24 bits precision, Yamaha D-PRE Class-A microphone preamplifiers, DSP Yamaha SSP2, DAW Cubase AI in the package and fully metal body. 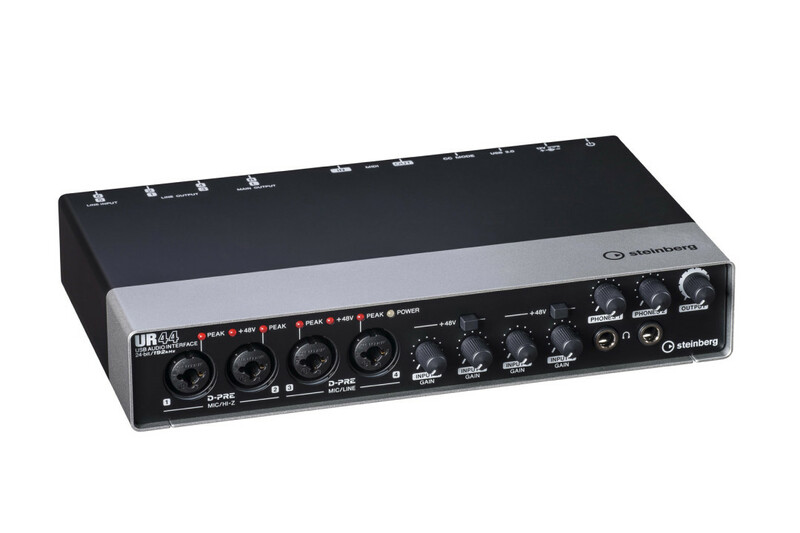 UR242 is different from older relative in less amount of connectors : 2 combined XLR/TRS 1/4″ jack inputs for microphone and linear input, 4 linear inputs on back panel and 1 TRS 1/4″ jack monitor headphones output with separate volume control. It is powered from additional line adapter, maximal power, sent to headphones, is a 15 mW; its mass is 1.3 kg and sizes are 198 ( width ) x 47 ( height ) x 159 ( depth ) mm; it draws maximum 5 W of energy. 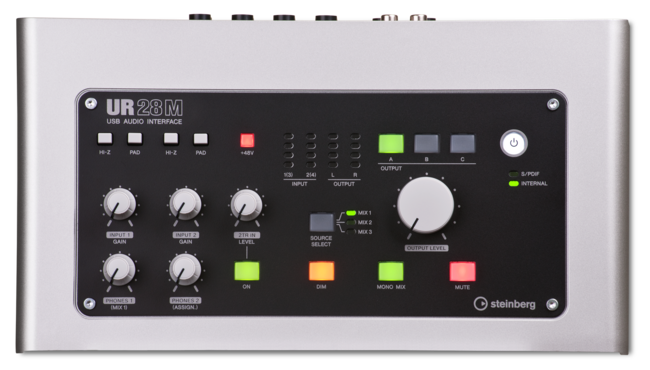 Steinberg UR22 is the audio card with even less amount of connectors ( there is need to note, that big amount of ports is not always necessary, for example, for small studio or for simple music and sounds listening ) : it has only 2 linear outputs, instead of 4. UR12 is simplified more : 1 microphone and 1 Hi-Z inputs and 2 linear outputs, without MIDI connectors. They are powered fully form USB port, maximal power, sent to headphones, is a 6 mW; mass of Steinberg UR22 is a 998 g and sizes are 159 ( width ) x 47 ( height ) x 159 ( depth ) mm; mass of Steinberg UR12 is a 850 g and sizes are 144 ( width ) x 47 ( height ) x 159 ( depth ) mm; they draw 2,5 W of energy. There is need to note, that cards’ prices go down in accordance with their functionality : 199.99 USD, 117.50 USD and 89.99 USD, accordingly, at the beginning of Autumn of 2015 year, so, there is ability to choose optimal variant for optimal price. When Steinberg UR audio interfaces are used with DAW Cubase, function True Integrated Monitoring becomes available in it, allowing to control all parameters of inputs and outputs, DSP effects and all other options of sound cards. Also devices support Loopback, allowing to mix all input channels and played back signal for sending to Internet streaming programs. They work in Mac OS X 10.7 and newer and Windows 7, 8, 8.1 and 10 with support of Core Audio, ASIO 2.0 and WDM interfaces for integration with modern DAWs : Avid Pro Tools, Ableton Live, Steinberg Cubase, FL Studio, Cackewalk Sonar, REAPER and others. Devices are Class Compliant and can work with Apple iPad 2 and newer with use of Apple iPad Camera Connection Kit or Lightning to USB Camera Adapter. 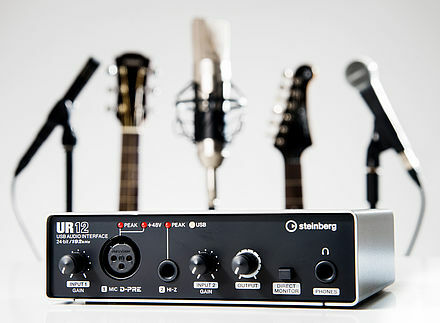 Dynamic range of Steinberg UR 242, 22 and 12 is a 101 dB ( A-Weighted ), to all microphone inputs there is ability to plug in phantom power +48 V; microphone and linear inputs and linear outputs can work in balanced and unbalanced modes, instrumental Hi-Z input works in unbalanced mode. Working frequency range of microphone/linear inputs of devices is 20 Hz – 22 kHz ( +0.1/-0.2 dB ); dynamic range is a 101 dB ( A-Weighted ); THD+N equals to 0.003%; maximal input signal level is a +24 dB; impedance is 4 kOhms; gain levels +12 – +56 dB; pad is down to -26 dB. Instrumental Hi-Z input has following characteristics : maximal input level is +8.5 dB; impedance is 1 MOhm; gain levels range is +4 – +48 dB; pad down to -26 dB. Linear inputs on back panels of devices have following characteristics : working frequency range is 20 Hz – 22 kHz ( +0.1/-0.2 dB ); dynamic range is 102 dB ( A-Weighted ); THD+N 0.003%; maximal input level is +22 dB; impedance is 30 kOhms ( for +4 dB input ) and 20 kOhms ( for -10 dB input ); for them signal modifications -12.5 dB ( for +4 dB input ) or +5.5 dB ( for -10 dB input ) can be switched. Working frequencies range of linear outputs is a 20 Hz – 22 kHz ( +0.1/-0.3 dB ); dynamic range is 104 dB ( A-Weighted ); THD+N 0.005%; maximal output level is +10 dB; impedance is 150 Ohms. Package contains : Steinberg UR 242, 22 or 12 audio interfaces themselves, USB cable, power adapter ( for UR242 ), CD-ROM disk with drivers and programs, user’s guide and warranty card. On optical disk there are : drivers, devices control panel and DSP effects ( for UR242 ) : dspMixFx, UR242 Extension ( for connection to DAW Cubase ), Basic FX Suite ( VST effects and processors set ), Sweet Spot Morphing Channel Strip ( compressor and equalizer ), REV-X ( reverberation ) and Guitar Amp Classics ( program emulator of guitar amplifier ). All in all devices are very good, they have great digital abilities and connectors, as well as optimal prices; there is also need to note that there are audio interfaces of Behringer, Focusrite, Roland, ESI, M-Audio, Alesis and other companies, that are better, than these ones in analogue part. Steinberg UR 242, 22 and 12 are great solutions for small studios and concerts, as well as high-quality in-home sounds and music playback. Lets study Panasonic Lumix G 20mm / F1.7 II ASPH objective lens with 20 mm fixed focus for Micro Four Thirds mounts. Its diaphragm is set in F1.7 – F/16 range with use of 7 blades; minimal focusing distance is 0.2 m; field of view is 57 degrees. There are 7 lens elements in 5 groups set in the objective, 2 of them are aspherical ( to reduce image geometrical and color distortions ); all lens are covered with protective and anti-reflective multicoating. There is ability to attach 46 mm optical filters to it; objective lens sizes are 63 x 25.5 mm, its weight is : 87 g; its body is made from metal, which increases its durability and reliability. It has no image stabilization functions and have automatic focusing with use of built-in motor. Package contains : Panasonic Lumix G 20mm / F1.7 II ASPH objective lens itself, front and back caps, lens storage bag and user’s manual. There is need to note, that this objective lens can be used not only with Panasonic cameras, but with all other cameras, that support Micro Four Thirds mounts, for example, Olympus. Lets continue our reviews of external sound cards with relatively new and very functional device Steinberg UR44. It is connected to computer via USB port, it is powered via it and additional power adapter. It works with sound with 192 kHz sampling rate ( and also supports rates 44.1, 48, 88.2, 96 and 176.4 kHz ) and 24 bits precision. It has 2 XLR/TRS combined inputs for microphone and Hi-Z input and 2 the same connectors for microphone and linear input ( for them card has phantom power +48 V switches and indicators, volume level controls and clip indicators ); 2 monitor headphones outputs with separate volume control. As well as overall device’s outputs volume control. On back panel it has MIDI input and output, 2 main linear TRS outputs, 4 linear TRS outputs and 2 linear TRS inputs; USB port for connection to computer, power adapter input, power button and Class Compliant mode switch. 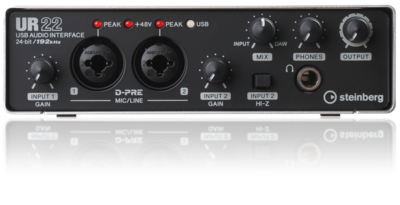 For all microphone inputs audio card uses high quality Yamaha D-PRE Class-A preamplifiers; it has built in hardware VST 3 effects, their processing is handled by Yamaha SSP2 DSP. 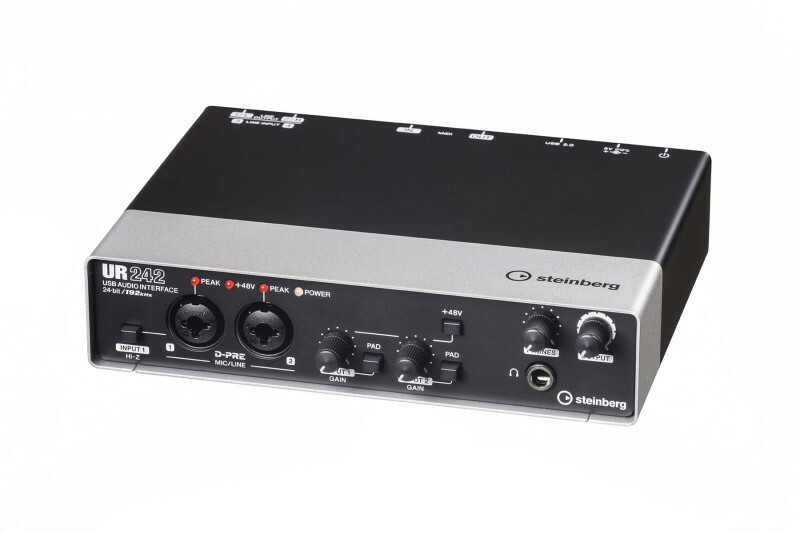 Steinberg UR44 can be switched into CC ( Class Compliant ) mode, in which it can work with Apple iPad devices version 2 or newer; this way there is ability to obtain high quality mobile recording solution. Steinberg UR44 is powered from separate line adapter, plugged in through separate port; its mass is 1.6 kg and sizes are 252 ( width ) x 47 ( height ) x 159 ( depth ) mm, it is released only black-silver color variant with fully aluminum body. Audio interface is supplied with DAW Cubase AI and VST effects and processors set Basic FX Suite. Dynamic range of device is 101 dB ( A-Weighted ), working frequencies range 20 Hz – 22 kHz ( with +0.1/-0.2 dB deviation ) and THD+N is equal to 0.003%. For installation of DAW Cubase AI there is need in connection to Internet for downloading of additional data with 500 MB size. Steinberg UR44 supports following DSP effects : Latency-free monitoring with FX ( dspMixFx ), True Integrated Monitoring with FX in Cubase, Guitar Amp Classics, REV-X Reverb, Sweet Spot Morphing Channel Strip, Phase switch per channel and High-Pass filter. Cubase AI – is a simplified version of professional DAW of Steinberg, it is based on the same audio engine with 32-bits float precision of calculations; can work simultaneously with 32 sound tracks, 48 MIDI tracks and 16 instrumental tracks with ability to record completed compositions to disk in WAV and AIFF formats, and in MP3 after purchsing of according module. For audio and MIDI editing in program following editors are built-in : Key, Score and Drum, pitch-shift instrument AudioWarp with support of ACID files format, which allows to use large amount of already created sounds samples, and Chord Track editor. 28 VST effects and processors are built into it for work with sounds, sampling synthesizer instrument HALion Sonic SE with 180 sound; mixing console with 4 Inserts and 4 Sends for each track and equalizer. DAW Cubase AI can work in 32 and 64 bits operating systems Windows and Mac OS X. Sound card is supplied with DAW Cubase AI, with which it is closely integrated, because card and DAW has the same manufacturer. Wherein it can work with other DAWs : FL Studio, REAPER, Cackewalk Sonar and others through ASIO 2.0 and WDM or Core Audio for Windows ( XP, Vista, 7, 8, 8, 8.1 and 10 ) and Mac OS X, accordingly. Body of audio card is produced from metal, this makes it easier to use card for mobile recordings and on the open scenes and reduces electromagnetic interference on the card’s internals. Also in the package with Steinberg UR44 device itself there are : CD-ROM disk with drivers and programs, USB cable, power adapter, warranty card and user’s guide. On optical disk there are following programs : Yamaha Steinberg USB Driver, UR44 Extension ( for integration with DAW Cubase ), dspMixFx UR44 ( for integration with other DAWs ), Basic FX Suite ( Sweet Spot Morphing Channel Strip – compressor and equalizer, REV-X – reverberation, and Guitar Amp Classics – program emulator of electric guitar amplifier ) and electronic versions of user’s guides of device and programs. All in all Steinberg UR44 is very functional sound card, which has very good characteristics and high quality hardware and costs the same amount of money or even less, than similar devices from other manufacturers; its price is around 250 USD. There is also ability to look on other audio interfaces of Steinberg, Behringer, Focusrite, Roland, ESI, M-Audio, Alesis and other companies production, which can have better analogue characteristics.